Two things! A few people told me I should start everything, which was very tempting!! I started out with "Quaker Diamonds." There are ton of color changes, but I'm loving how it's turning out. I got the stranded Valdani instead of the spools because I knew I wanted to stitch it on 40 ct.
40 ct. Legacy linen by Picture this Plus, Valdani Threads. 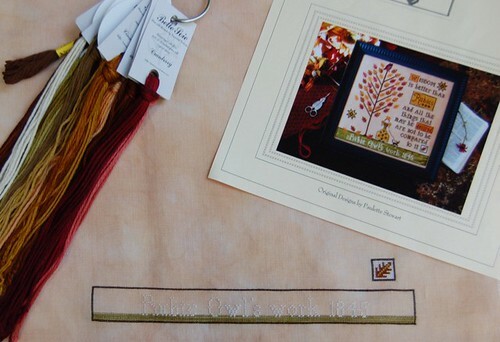 After stitching on "Quaker Diamonds" for a couple hours I decided I would start "Rubie Owl's Sampler." I have loved this design for so long. Once I started stitching I really fell in love! 40 ct. Vintage Sand Dune by Lakeside Linen, NPI and Belle Soie Silks. Two lovely new starts. Look forward to seeing your progress. The cake looks gorgeous. Congratulations on the new processes! I will watch with interest for their advancement. Hi! I'm going to begin "quaker diamond" too! it's so beautiful! Could you tell me where I can find a linen 40cts vintage like yours? Those are two really great starts, but I wondered how you held off from stitching on everything! That cake looks absolutely yummy! 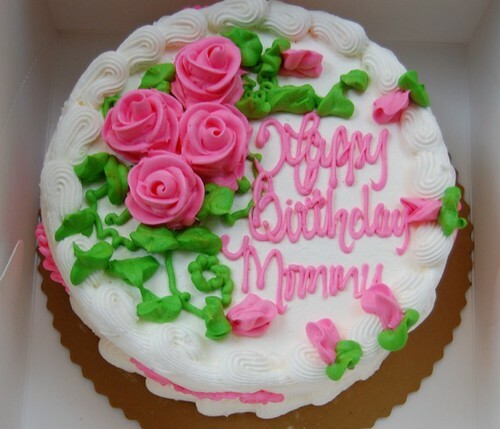 That cake is beautiful and the icing is making me crave something sweet right now! Great progress on your starts! Nice starts! Glad you had a great birthday! Looks like a great cake! Yum! There's not a whole lot better then a cake from Publix bakery. I love both of your starts. I'm anxious to see how Quaker Diamonds turns out. I keep looking at it. Wonderful! I started JB Christmas Yesterday, and though I love it I'm feeling a smidge of burnout, lol! Should I take a break, or make another new start!? lol! Love both of your starts! The cake looks really yummy. Where did you order your Picture This Plus fabric? I need an easy source for ordering this type of fabric. Happy Birthday, and beautiful starts, Nicole! Nicole I just love your new starts and Ruby Owl is one that I love too because of the beautiful bright colors. I am going to order that one from Amy I think eventually. I also love this Quaker designs with pretty colors. Happy Birthday...sorry so late! But that was a great cake and raspberry would be my favorite! I can taste it now with chocolate. Oh...that cake looks so good! Oh, Nicole, I'm a bit late, but Happy Birthday to you! Hope you have a wonderful year ahead! 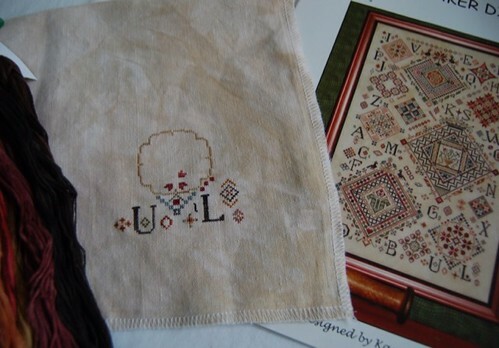 I do love your choice in stitching projects. I'm enjoying seeing your progress, and as usual, your photos are wonderful. Thanks for sharing! Great choice for new starts! Happy Birthday, Nicole! The cake looks yummy. Love your new starts and looking forward to see your progress. Quaker Diamond's is definitely a wonderful pattern !! Very pretty!!!! Love them both. A very Happy belated Birthday Nicole! 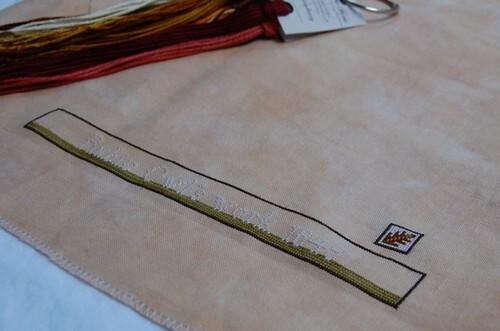 Do you stitch with one thread the quaker diamonds? I like the patterns you stitch!